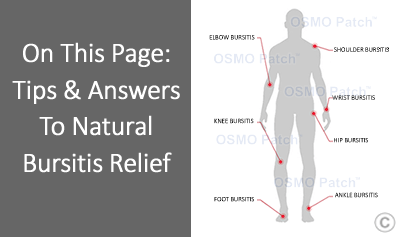 So if you are suffering from bursitis and nothing else seems to have worked, or you just want to discover a natural treatment option, then the OSMO Patch may be the ANSWER!. Often when we talk to individuals with bursitis they are either continuing physical activities that may have initially contributed to the condition or they have begun an exercise regimen to strengthen the area in the hope of relieving their bursitis symptoms. Unfortunately, exercises for bursitis or other such physical activates only place more stress on the injury, resulting in further aggravating the condition. Unlike a muscular injury, which can respond well to massage, bursitis contains inflammatory fluids which are encapsulated in the inflamed and swollen synovial lining of the bursa. The problem with massage is that the fluid cannot be dispersed since it is encapsulated. Furthermore massaging directly over the bursitis will only further irritate the already inflamed synovial lining. Massaging can however be extremely good for relieving areas where there is referred pain. Often people with bursitis may experience pain in different muscles near where the bursitis is. If you are seeing a massage therapist it is a good idea to have discussion with them and request that they do not massage anywhere directly over or close to the bursitis. Any good massage therapist will have your best interests at heart and be more than happy to work with you to achieve the best outcome. After the first 72 hrs has passed, then heat becomes the preferred option. This is due to the fact that heat promotes blood flow, which is necessary for the healing process. IMPORTANT: Do not use heat if an infection is suspected. 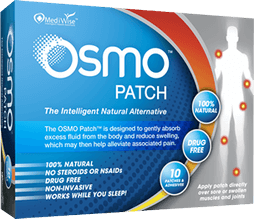 The OSMO Patch contains absolutely no steroids or drugs and they are completely non-invasive. Used in combination with proper rest, the OSMO Patch now provides a natural alternative way to support the relief of inflammation and pain associated with bursitis. So if you are ready for a natural approach to reducing, swelling, inflammation and associated pain due to knee bursitis and once again regaining your quality of life… Then the OSMO Patch is the Answer!